Overview: You recall the creation of Captain America, right? I’m not talking about the character’s origin story in the comics. Rather, I refer to the creation of the character in 1940. Writer Joe Simon doodled out a concept called Super American, but decided there were too many Supers in comics those days. So he gave him the title Captain, tweaked the name, and brought in artist Jack Kirby to flesh it out. Captain America Comics #1, featuring Captain America punching out Adolf Hitler, came out in late December of 1940, nearly a full year before the bombing of Pearl Harbor. So the history is there that Jack Kirby has been there since Day 1 with the adventures of Steve Rogers. Flash forward to 1975, and Marvel re-signs Jack Kirby to a contract after a five-year run at DC. Part of the deal gave Kirby creative control of his books, so he did a lot of titles that fell on the fringes of the Marvel Universe, such as The Eternals and Devil Dinosaur. But he was also given the chance to write and draw Captain America. Kirby jumped in head first and turned the action level up to 11 with the start of his run in the monthly Cap book. Kirby takes Captain America (and the Falcon) on a MAD run across the country in search of a BOMB. (Yes, that is a subtle plug to the main storyline, Madbomb.) In typical Kirby fashion, there are a lot of Nazis, a lot of 1950s monster references, and a lot of fist-fighting — maybe this is what Kirby was most comfortable drawing, or what he thought would sell best. Marvel really didn’t care, because it was still new art by the King. What makes this Essential? : If Marvel had planned things out more in advance, they could have easily made this an Essential Captain America by Jack Kirby volume. 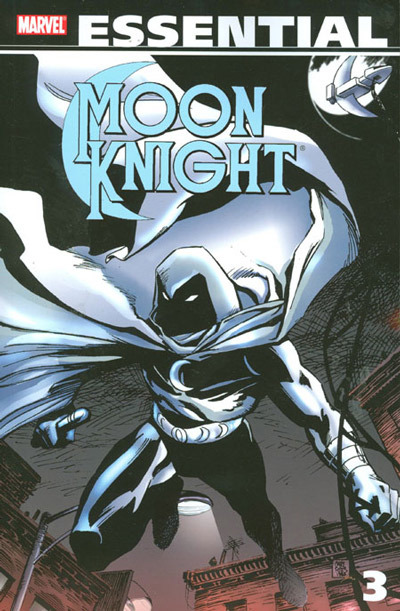 This volume contains six issues before Kirby took over the title. This Essential ends with issue #205, and Kirby’s run ends ten issues later (including Annual #4) with issue #214. So it could have been possible to get all of the Kirby run in one Essential. Alas, it did not work out that way. Regardless, this collection is worth a look for the Kirby issues. I will be the first to admit that this is not Kirby’s greatest work. Part of the deal to get Kirby to return to Marvel required giving him more creative freedom and less editorial supervision. I’ve contended for many years that writers and/or artists should not be their own editors. The stories could have been helped some by another voice providing input and suggestions. These are action-packed stories, but there is very little character development going on here. 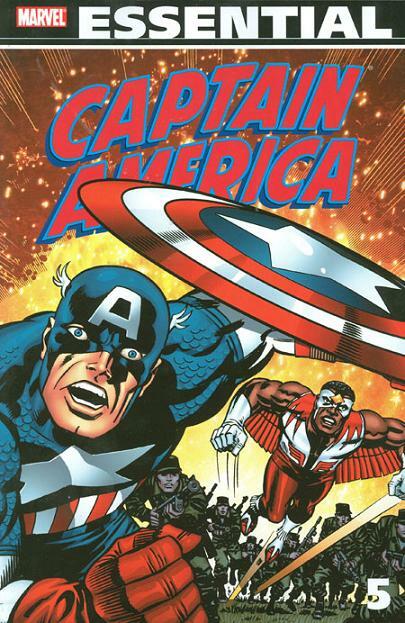 Footnotes: Captain America’s Bicentennial Battles #1 was initially published as an over-sized Treasury edition. Because of the size of the treasury, the page dimensions to not scale down properly for the Essential formatting, which leads to extra white space on the bottom of each page. If you like this volume, try: the Captain America volume from 2013 by Rick Remender and John Romita, Jr. This was another re-launch with the All-New Marvel event. In this storyline, Captain America is thrown into Dimension Z, a post-apocalyptic world ruled by Arnim Zola. There is no United States or no American Dream to defend. Steve Rogers just has to be a man standing up for what is right. 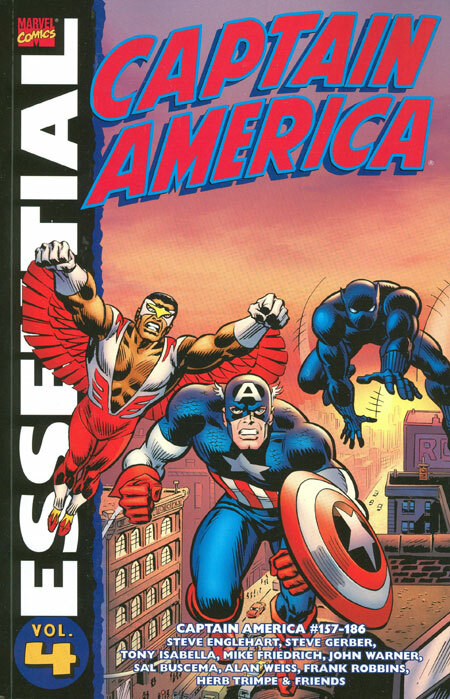 While this storyline ran over the course of 1 year in publishing time, the events of the story cover 10 years in Captain America’s life. Along the way, Cap gains a son, but is he the father? The story as well as the art echoes back to the frenzied approach that Jack Kirby took in the stories in this Essential. And much like the 1970s Kirby run on Captain America, this run by Remender & Romita, Jr. is either really loved or really hated. This isn’t your typical Captain America storyline, so you have to be willing to accept the character in this different environment. Overview: (With apologies to Universal TV) Dr. Bruce Banner, scientist, searching for a way to tap into the hidden potentials of gamma energy. Then an accidental overdose of gamma radiation interacts with his unique body chemistry. And now, when Bruce Banner grows angry or outraged, a startling metamorphosis occurs. With that, I welcome you to the fifth volume in the Essential Hulk line. This is an interesting volume which can be divided up into three sections. Section 1 would be Incredible Hulk #171 to #179. These are your typical Hulk stories like we saw in the last Essential. There is an interesting story that ran over multiple issues involving the Hulk ending up on the High Evolutionary’s counter-Earth where he meets Adam Warlock. In fact, Warlock dies for the first time in issue #177 and is promptly resurrected in issue #178. It’s hard to keep a good Warlock down, I guess. The final issue of this section features the start of Len Wein’s run as writer on the title, which would last for 3 1/2 years. Now, Section 2 is just two issues long, #180 and #181. Why just two issues? Well, the Hulk finds himself in Canada, where he goes up against the Wendigo. 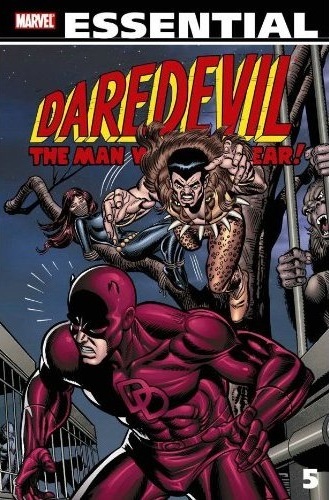 As if that was not enough for the Hulk to handle, we are introduced to Canada’s Weapon X, also known as the Wolverine! Yep, everyone’s favorite mutant makes his first humble appearance in these pages. Mind you, the Wolverine portrayed here is not as refined as the one we came to know in the pages of Uncanny X-Men and later his self-titled book. But he’s still short and hairy and feisty, and willing to cut anyone or anything with his adamantium claws. Eventually, the Wendigo is defeated, and the two heroes go their separate ways. Section 3 picks up with issue #182 and runs until the end of the book. The stories here feel much like the stories in Section 1. We do see the end of one era and the start of the next era, both related to the art duties. Herb Trimpe ends his six-year run on the title and is followed by Sal Buscema, who begins what will be a nearly 10 year run on the title. One highlight from this run is the Incredible Hulk Annual #5, which features the Hulk battling six monsters from Marvel’s 1950s Atlas books. In fact, one of the monsters makes his second ever appearance in this book. Some guy named Groot. Wonder what Marvel ever did with that walking tree creature? What makes this Essential? : I am amazed that Incredible Hulk #180 and #181 (first appearance of Wolverine) did not get reprinted in any other Essentials, such as in Wolverine, Classic X-Men, or X-Men. So for these two issues alone, this volume is ESSENTIAL. Outside of those two issues, the Hulk stories are decent, but not incredible (no pun intended) or memorable. Trimpe’s run on art duties comes to an end, and Sal Buscema takes over for a run that would last nearly ten years. 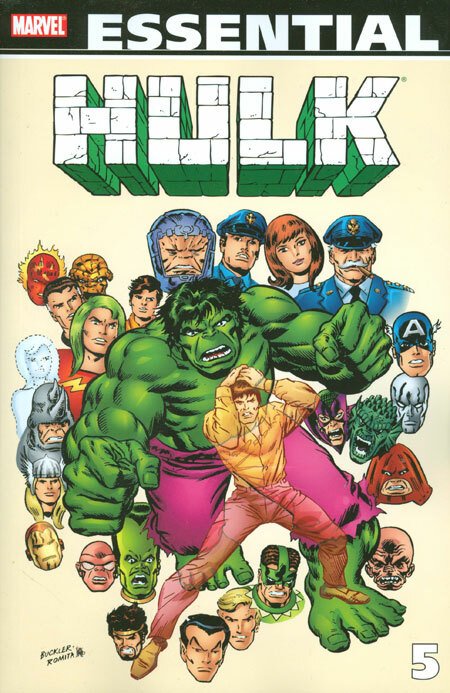 I think a Hulk fan should definitely have this collection on their bookshelf. Footnotes: Incredible Hulk #176 to #178 are also reprinted in Essential Warlock Vol. 1. If you like this volume, try: the Planet Hulk collection, which collects Greg Pak’s story from 2006 & 2007. The Illuminati (Mr. Fantastic, Iron Man, Dr. Strange, Professor Xavier, Black Bolt, and Namor) vote to exile the Hulk to another planet rather than allow him to roam (and damage) the Earth. (This is a very similar approach to the events of Incredible Hulk #300 when Dr. Strange exiled the mindless Hulk to an alternate dimension.) However, the rocket carrying the Hulk goes off track, and lands on a different planet, Sakaar, where gladiators battle in arenas for the amusement of the emperor. The Hulk unites with a band of gladiators, who look out for each other during the fights. The Hulk and his friends eventually escape and then overthrows the Emperor. The Hulk is named the new emperor, and he takes a wife and settles down into his role. However, the rocket that brought him to Sakaar explodes, destroying the capital city and killing the Hulk’s wife. Hulk vows revenge on the Illuminati and takes his fellow gladiators back to Earth. The only way to fully describe this book is “epic”. This is one of the all-time great Hulk stories and should be a must-read for all fans. Overview: Johnny Blaze is a motorcycle daredevil with a traveling road show. When the owner of the show, Crash Simpson, announces he is dying from cancer, Blaze seeks out and strikes a deal with Devil for his soul in an attempt to save Crash. The Devil accepts, but like any deal with Satan, the deal works against Blaze. Crash is saved from cancer but still dies in a stunt accident. As part of his deal, Johnny Blaze is transformed into a mystical servant of Hell, known as the Ghost Rider. The early stories deal with Blaze trying to free his soul from the control of Satan. This leads to the introduction of the devil’s estranged offspring, Daimon Hellstrom, who would become an anti-hero in his own right as the Son of Satan. Eventually, Blaze gets his soul released, but he still retains the Ghost Rider abilities. Early on, his transformations occurred at dusk, but now Blaze finds that he can now control the transition for anytime day or night. He can also extend his powers to create a flaming motorcycle out of the hellfire at his control. In the later issues, Blaze starts working in Hollywood as a stuntman on a television show, where he meets the actress Karen Page. For longtime Marvel readers, you will recall Page as the one-time secretary of lawyer Matt Murdock. So it’s only natural that Ghost Rider would cross paths with Daredevil, the man without fear, which is exactly what happens as this volume concludes. What makes this Essential? : I will be the first to admit that I have never been a Ghost Rider fan. I held off getting this book for as long as I possibly could, just out my general dislike for the character. What I found reading the early stories of Johnny Blaze is a far different Ghost Rider than the one that gained such popularity in the 1990s. This Ghost Rider seems more human, whose initial changes were brought on by the setting and rising of the sun. He’s a true anti-hero, never viewing himself as a super-hero; just much more interested in riding his bike at the next show. Based on his history in the Marvel Universe, the Ghost Rider is an important hero to read. But the Ghost Rider in these stories is much different than the Ghost Rider you picture in your head. 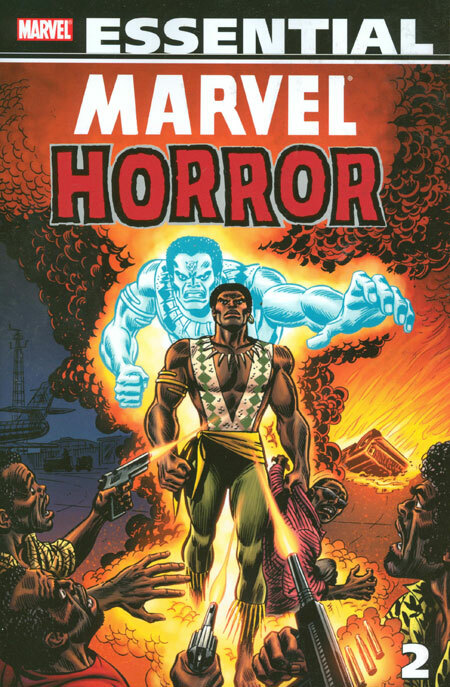 Footnotes: Marvel Spotlight #12, and Ghost Rider #1 & #2 are also reprinted in Essential Marvel Horror Vol. 1. Ghost Rider #10 is a reprint of Marvel Spotlight #5. 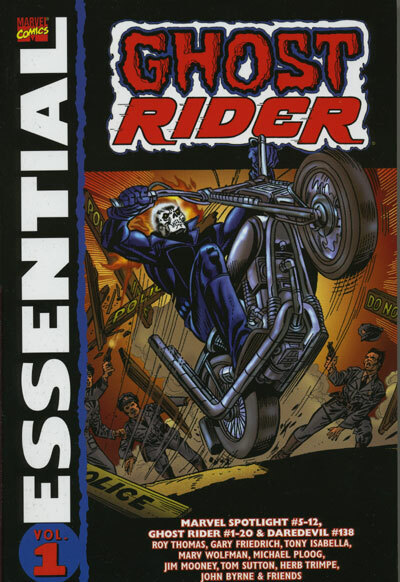 The cover to Ghost Rider #10 is included in this volume. In the letter column in Ghost Rider #11, it was revealed that the cover for issue #10 went to press before Marvel realized that the issue would not be ready in time. Ghost Rider #19 & #20, and Daredevil #138 are also reprinted in Essential Daredevil Vol. 6. There are two early Ghost Rider appearances that are not collected in this volume, but they can be found in other Essential volumes. Marvel Team-Up #15 (November 1973) can be found in Essential Marvel Team-Up Vol. 1, and Marvel Two-in-One #8 (March 1975) can be found in Essential Marvel Two-in-One Vol. 1. In my opinion, both should have been included, given the number of references to those stories in the Ghost Rider title. In particular, the Marvel Team-Up issue features the first appearance of The Orb, who returns as a foe in Ghost Rider #14 and #15. If you like this volume, try: Marvel’s first team of heroes in California, The Champions. Created by Tony Isabella to feature Angel, Iceman, and Black Goliath, it was retooled without Black Goliath and with the additions of Black Widow, Hercules, and Ghost Rider. Given the diverse line-up of the team, there were a lot of wild adventures during the team’s all-too-short 17 issue run. The Champions #1 (October 1975) debuted during the period covered in this Essential Ghost Rider, and several issues make references to his adventures with the team. While the entire series is collected in two Classic volumes, this is a series that shows up frequently in back issue bins. Make a point to track this series down!